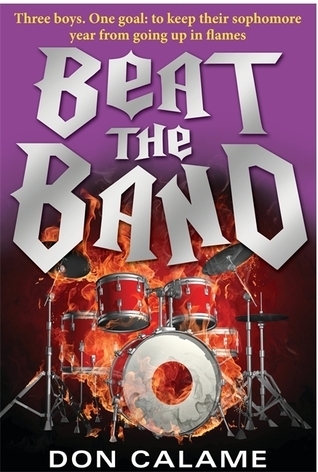 Beat the Band was exactly what I was expecting after reading Swim the Fly last year. It's crude, funny and a better insight into the brain of a teenage boy that I probably needed! The bos are back and on form. They manage to muddle themselves through a series of madcap events from coop having to join up with a social outcast to do a class presentation on contraception to them 3 boys entering a battle of the bands competition despite the fact they can't actually play any instruments. I actually loved Coop's dad in this book and the way in which he used the boys mad-cap plans as an excuse to relive his teenage years again. I loved how he probably got more carried away than way the boys did and loved every minute of it. The relationship that was built up between Coop and Helen was awesome. I love how Coop did that proper teenage booy thing of pretending not to like the girl who no one else likes in a bid to to look cool even though secretly he really started to fall for her. If I'm honest I think I prefered Swim the Fly purely because I think I liked Matt as character more that Cooper who is a bit too crude (even though he has that sweet edge) for my liking. An entertaining laugh out loud read which I enjoyed. I loved this and swim the fly but have to agree that they are both better insights into a teen boys mind then I need! I cant wait for the third one next year!! I've just finished Swim the Fly, which I enjoyed for the most part. I'll be interested to see if he manages to repeat the success with Coop as a protagonist - bit of a risky move!